Design proposals will create a vibrant contemporary building for study, interaction and exploration. The existing Templeman Library, at the centre of the Canterbury campus with stunning views of Canterbury and the cathedral, was designed by Lord Holford and constructed in three phases between 1965 and 1990. It has been frequently adjusted in its lifetime to accommodate changing needs of the growing student and research community. 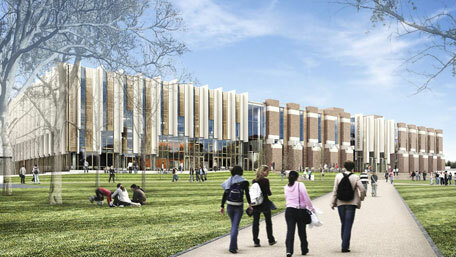 In 2008 “A Vision for the future” document was created setting out how the Templeman Library could be transformed to create a leading 21st century university library capable of delivering a comprehensive range of facilities, services and resources to the University and its stakeholders. Having secured funding, a national design competition was held in 2011/12. The ambitious winning design by architects Penoyre & Prasad has been developed in close collaboration with the University’s Information Services and Estates teams. It will provide a 5,350m2 extension to the existing library, and refurbishment of the original building to create a contemporary, digitally engaged and resource-rich university library. More information and images on the University of Kent website.